This little recipe may just be the best, best, best thing I have ever come up with in the kitchen–and I am quite proud of myself for thinking of it. Strawberry and mint seem strange together to you? Just try it. This salad is oh so so good! 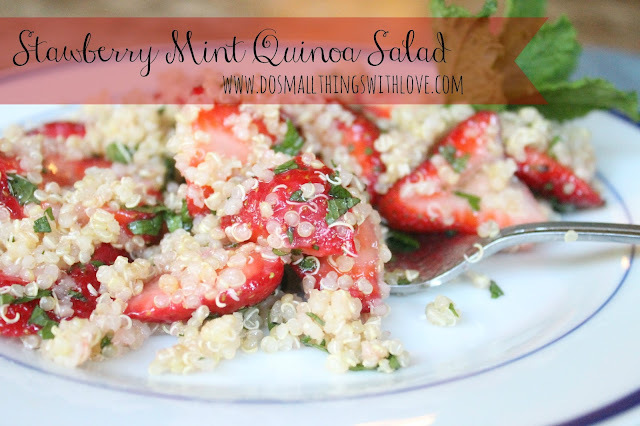 It is the perfect summer salad, and unlike something like potato salad, or some other mayo-based salad, this is really good for you! Plus, it gave me an opportunity to use some of the mint that is overtaking my garden. Cook the Quinoa. Place Quinoa and slightly salted water in a skillet and heat to boil. Reduce heat and simmer for about 20 minutes, or until Quinoa is tender. Place Quinoa aside and allow to cool completely. Mix up the vinaigrette. Combine vinegar, oil, honey and pepper. Wisk until completely combined. Finally, combine all of the elements. Add the vinaigrette slowly. You may not need it all. Garnish with a little extra mint–and dig in. Seriously, so good! I hope you enjoy it as much as my husband and I do! Try it and let me know. 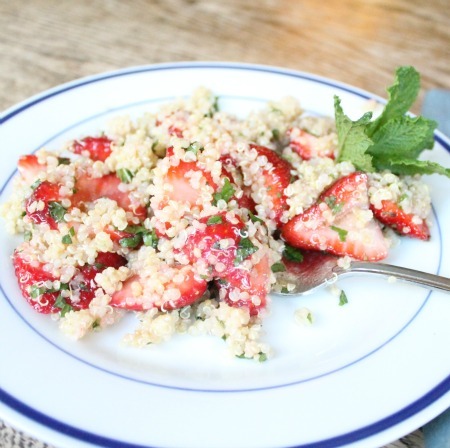 And, if you have a favorite way to fix quinoa, I’d love to you have share it! YUm to the TUM. So glad you linked up, sister! Thank you so much for joining the party with this delicious number. A win for quinoa all the way. no way–you’re still getting strawberries! Incredible! I am going to try this! Sounds wonderful. I have tons of fresh strawberries from my garden as well as lots of mint too! I hope to find you again to share my comment! I can’t wait to try this!